“Please” is one of the more understated, celestial songs on TEEN‘s terrific new album Love Yes. The band recently recorded a live session in NYC for Sofar Sounds, which puts on intimate, paired-down shows all over country. With only synth and violin backing, you can really focus on TEEN’s otherworldly harmonies. Watch that below. TEEN are currently on tour which will include, surprise surprise, a stay at SXSW. 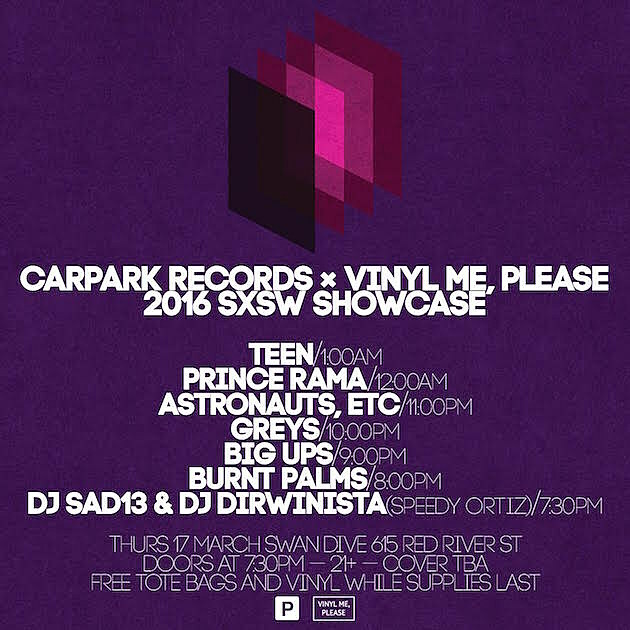 Among the shows, they’ll headline the official Carpark showcase which happens March 17 at Swan Dive and also has Prince Rama, Astronauts Etc, Greys, Big Ups, and Burnt Palms, with a DJ set from DJ Sad13 & DJ Dirwinista (of Speedy Ortiz). The showcase is sponsored by Vinyl Me Please and there’ll be free tote bags and vinyl records while supplies last. Flyer for that is below. The band also recently stopped by WNYC’s “Soundcheck.” You can listen to that, and check out a list of updated tour dates, below.